Eva Napierkowski is a junior studying neuroscience at Notre Dame. 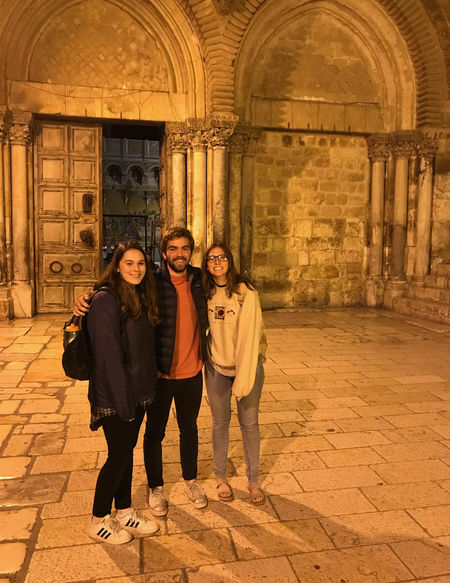 Originally from Broomfield, Colorado, Eva traveled to Jerusalem last fall to experience the Holy Land through Notre Dame International’s study abroad program. She shares some of the highlights of her trip and talks about what it was like to spend a night at the Church of the Holy Sepulchre. For me, the decision to study abroad in Jerusalem was fueled by a parallel desire to explore the Holy Land and to learn more about the seemingly ever-present conflict that the land is embroiled in. The first two weeks, we embarked on a geopolitical tour that provided interesting and essential background information regarding what is generally known as the “Arab-Israeli conflict." As I continued to live in Jerusalem and make friends with locals, my political education flourished alongside daily studies at Hebrew University. On the weekends, I did my best to see as much of the area as possible, and eventually made it to Jericho, Nazareth, and the Golan Heights among other places. However, I found that the most influential part of the Holy Land that I visited was situated right in the center of Jerusalem: the Church of the Holy Sepulchre. Early Church tradition locates the Holy Sepulchre as the place of Jesus’ crucifixion, burial, and Resurrection. Its important location makes it central to several religious groups, including Roman Catholics, Greek Orthodox, and Armenian Orthodox. Every night, fifteen lucky Roman Catholics can spend the night in the Holy Sepulchre locked in for a night of reflective prayer. At 7 pm, two of my classmates and I entered the doors, and heard the loud clink of the bolt in the door. We would stay in that church for the duration of the night. While the Church is usually a highly trafficked pilgrimage site during the day, at night it assumes a wholly new atmosphere of meditative silence. For the first few hours, I wandered the ancient church, admiring the work and venerating the holy sites. I got to spend as much time as I wanted at the place of the crucifixion and in prayer in Jesus’ empty tomb, sites that someone must usually wait in a long line to witness. Then, exactly at midnight, the doors slammed open, and a long procession of Orthodox Catholics walked in to perform their Divine Liturgy. I witnessed this ceremony and got to spend more quiet time listening to their prayers in the background. Finally, at 4 am the doors unlocked and we attended mass with the local Jerusalem early risers. At 4:30 am, we exited the church, and watched the sun rise over a sleepy Jerusalem. My Jerusalem experience was full of adventure, hiking, swimming, and new friendships, but I am especially thankful for this opportunity to strengthen my friendship with Christ. If you're interested in learning more about the Jerusalem study abroad program, visit the website or contact Jerusalem Program Director Laura Stipic. Originally published by Colleen Wilcox at jerusalem.nd.edu on January 16, 2019.